During the summer months, I’m in the mountains as often as the weather (and my job) allow me to be. Over the years I’ve tried to make my hiking pack as light as possible but there’s one thing I just don’t like to skimp on: water. 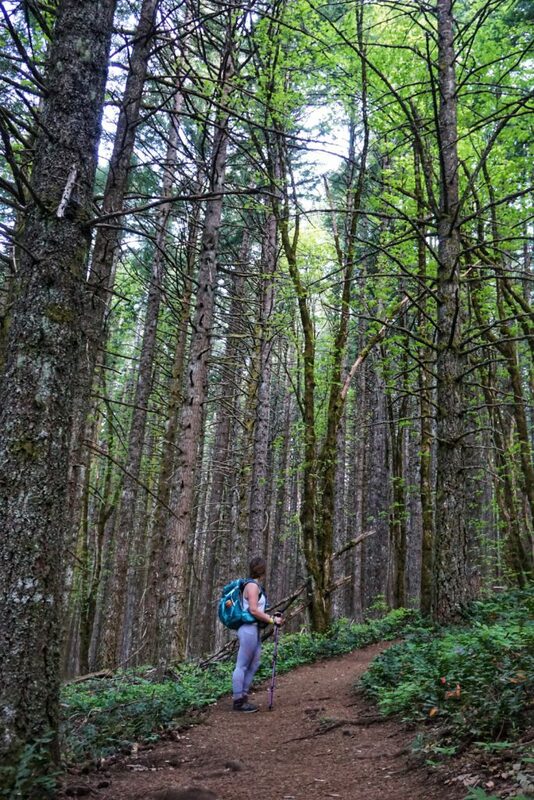 With Grayl’s Ultralight Purifier Bottle I’m able to lighten the load by packing enough water for the hike in – and leaving it to my self-purifying water bottle to take care of the rest. Grayl’s Ultralight Water Purifier Bottle is an easy-to-use, lightweight, sleek design that is changing the market (and the world) one bottle at a time. Weighing in at just under 11 oz. this is one of the lightest water filters out there. It fits right in the side pocket of my backpack – making it accessible without having to stop and unload my entire bag. I also found it nice that with the lid, outer bottle and filter there are only three parts total. 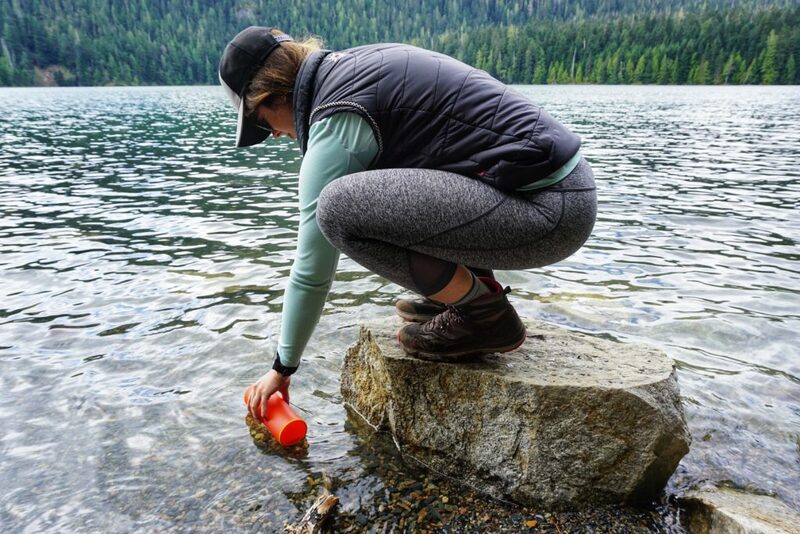 I’ve used other filters in the past that have multiple parts that you have to hope you don’t misplace – Grayl’s Ultralight Purifier Bottle keeps it simple and avoids complication and extra weight with just three pieces. 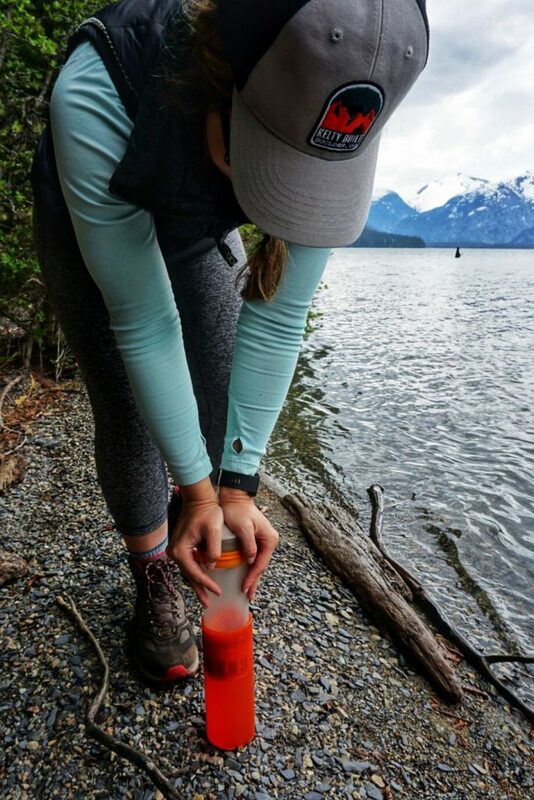 The 16 oz bottle is the perfect size/weight for your backpacking kit – small enough to fit in most cup holders and in the outside pocket of your pack, but big enough that you don’t have to keep filtering over and over. The loop on the lid also makes it easy to hook it onto your pack if other pockets are in use. 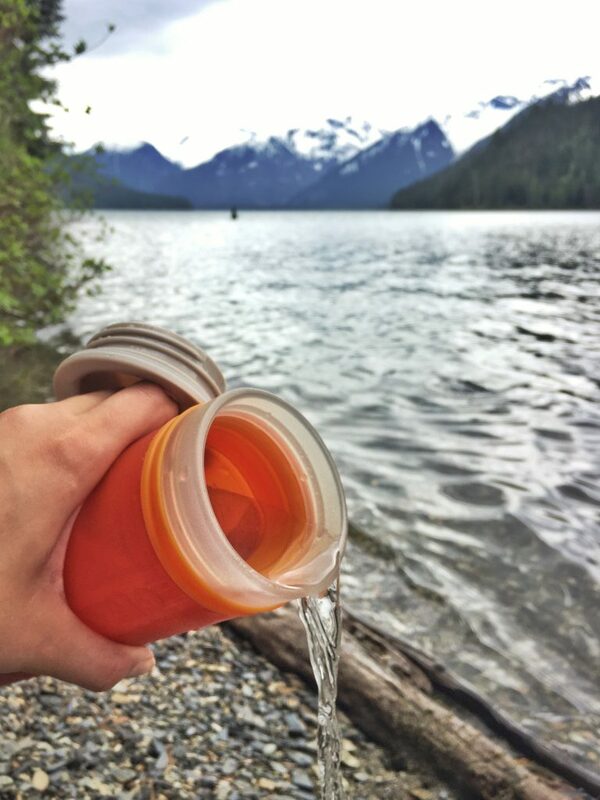 The Ultralight is one of the easiest water filters I’ve ever used. Anyone can use it – even 60-something women with arthritis (aka my mom). And I have to admit when I first realized you have to replace the filter I was like “Oh, there’s the catch.” But each filter lasts for 300 USES! 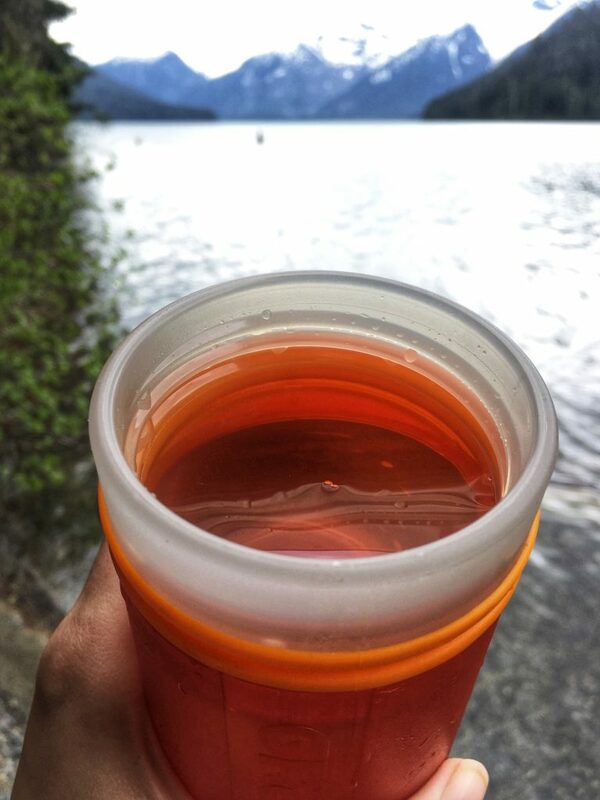 I’ve already used it four times, filtering water from Lake Roesiger, WA; Icicle Creek in Leavenworth, WA; Columbia River Gorge; and Lake Cheakamus in Whistler, BC. Each time I drank my freshly filtered water I fell in love all over again. No tiny chunks. No bad taste. The Ultralight is pure genius. With the design of the filter and bottle mimicking that of a french press, it is not only easy to use but it saves you time and energy. With other filters requiring you to sip water through a straw and/or get stuck awkwardly sitting by the water pumping water through your filter – both of which I have done using other water filtration systems. 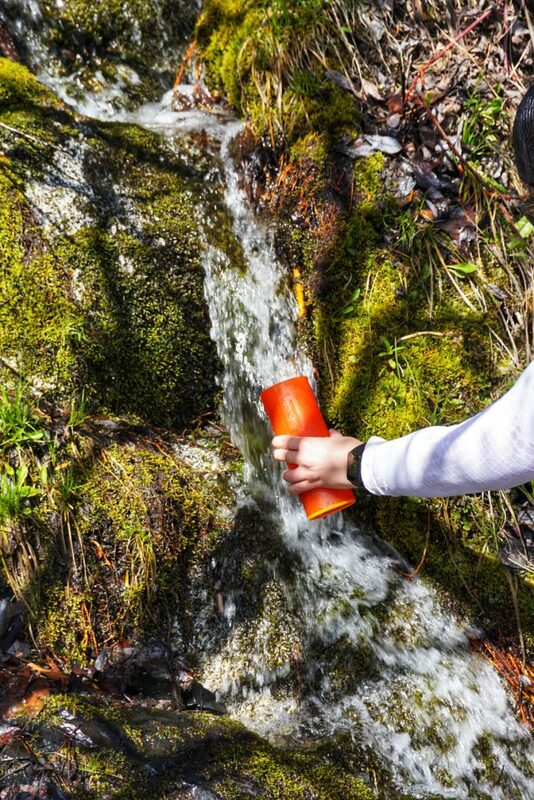 The Ultralight lets you gather up the dirty water, push the filter through, and get on with your hike in a matter of seconds! Worried about your filter getting nasty between uses? Don’t worry, Grayl thought about that too. The Ultralight has antimicrobial agents that keep the purifier fresh between uses. Being that I’m a weekend warrior hogging up every second of the weekend adventuring, I don’t want to have to spend hours cleaning my gear and hoping it doesn’t grow something while it’s sitting in my garage for a week. With the Ultralight there’s no need for that – in fact, you can kiss your back-filtering days goodbye! If you are someone who is only looking to only purchase one water filtration system I strongly suggest The Grayl Ultralight Purifier Bottle. Not only is it more affordable than several of its competitors (under $60) but it is fast, simple, and (with up to 300 uses per filter) it will probably last longer than you! Just the fact that it filters out 99.9999% of viruses and is still able to filter 2 L per minute makes me wonder why everyone doesn’t have one yet. 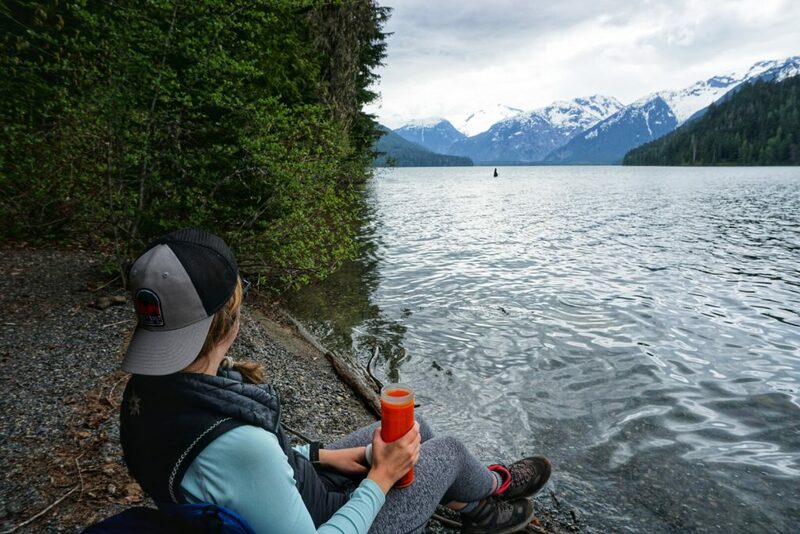 Whether you are someone who has been backpacking for over 30 years and have perfected the ultra-lite game or you’re prepping to spend your first summer camping under the starts, don’t leave home without the Grayl Ultralight Purifier Bottle. After all, when was the last time you bought a product that has the potential to change the world? 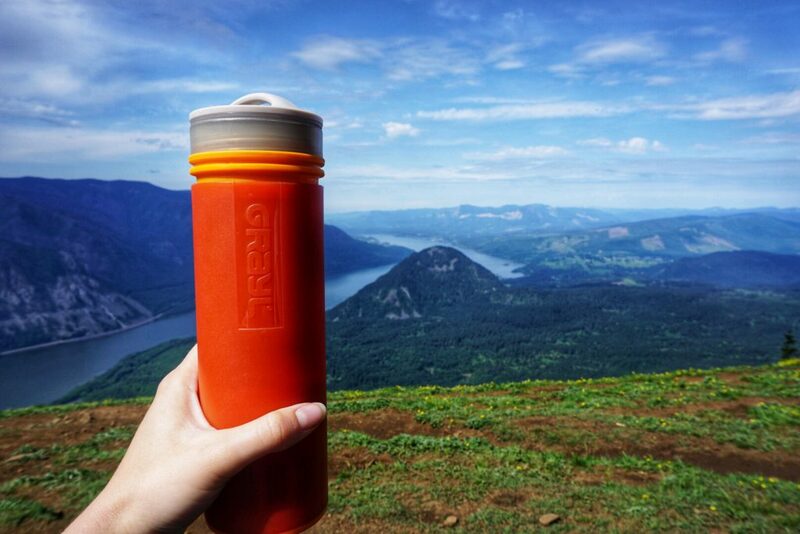 Shop the Grayl Ultralight Purifier Bottle on Outdoor Prolink. Not a member? Apply today! Kelly is a PSIA-certified alpine ski instructor from Seattle, WA who has a passion for the outdoors. 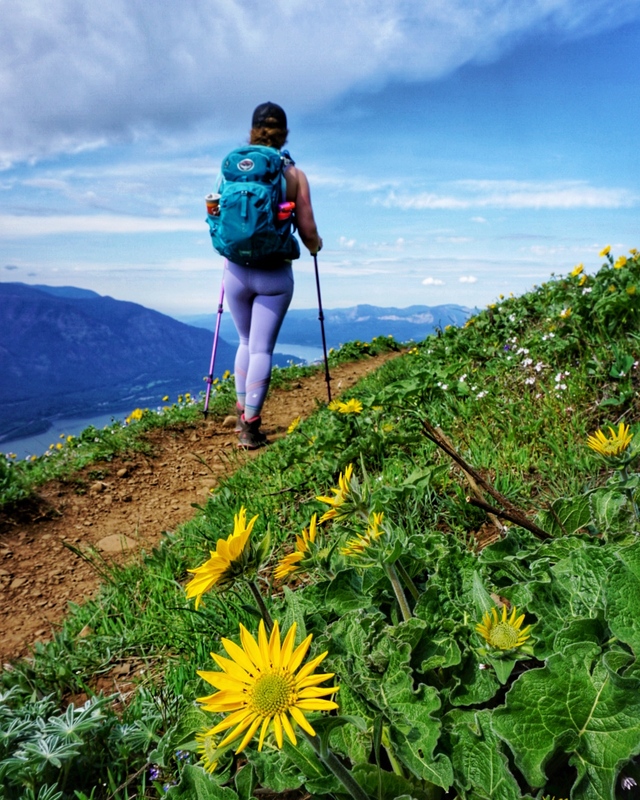 When she is not teaching skiing you will most likely find her hiking, backpacking, or snowshoeing throughout the Pacific North West with her labradoodle, Daisy.